Looking to combine your love of children with travel? It's a short-term commitment (2-3 months). Spain is a beautiful country with a ton of fascinating culture. All your major living expenses will be covered and you'll receive a weekly stipend. 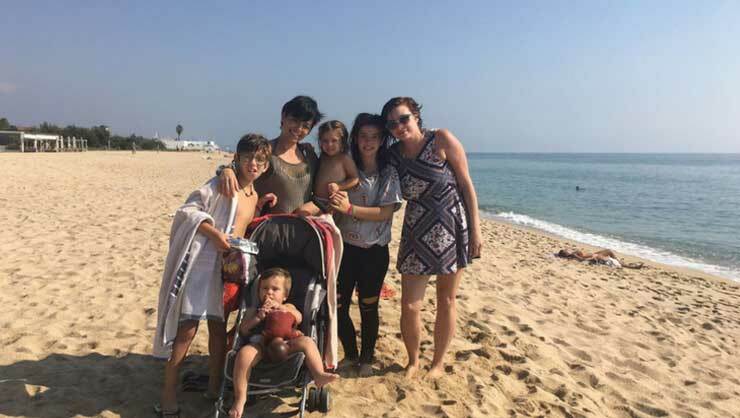 Nicole with her host family on the beach. Image courtesy of Nicole S.
Most InterExchange host families live in the suburbs of Madrid. It's expensive for a family to live right in the city center, but Spain is well-connected with trains and buses so getting around is easy. Many families in Spain prefer an English-speaking au pair since they'd like to provide more English exposure to their children. Since the InterExchange Au Pair Spain program is three months maximum (you're welcome to stay between eight and 12 weeks), you don't need a visa! The Schengen Area requirements allow U.S. citizens to enter the Area (which includes Spain) and remain for up to 90 days within a 180-day period as a tourist. This means you don't have to worry about obtaining a visa. Host families want to be sure that they're making a good choice, just as you want to be confident that you're joining a friendly home. Take some time to craft a thoughtful “Dear Host Family” letter and include a few friendly-looking photos in your application. Check everything over for spelling and grammar. For a lot of people, this can indicate whether you're willing to put time and thought into your responsibilities. TIP: Including a 20-second selfie video where you introduce yourself to potential families will give your application a personal touch, and can go a long way towards instilling confidence. A host family shouldn't just be a family you're okay living with; they should be people you feel like you can thrive with. You'll have a chance to connect with potential families via video chat so you can get a good sense of their personalities and expectations. Keep in mind that host families may also be considering multiple options, so don't expect to match immediately. Tamara with her host kids. image courtesy of Tamara P.
We'll be here to help, but you and the families are central to the matching process. Take your time and ask all the questions you need when you connect with a potential host for a video chat. Once you're accepted to the program, you can refer to our set of questions to ask your potential family. 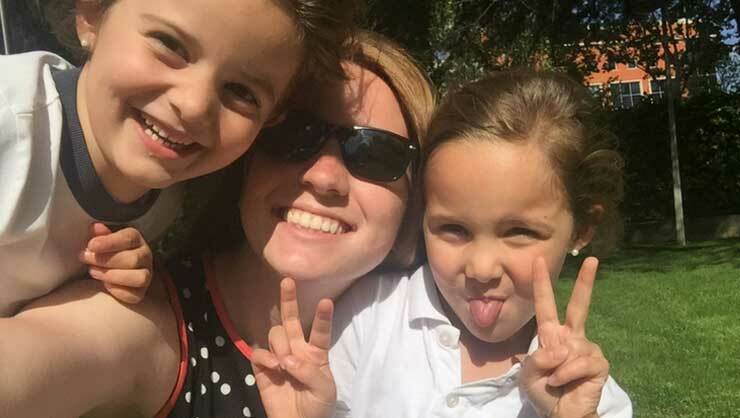 You don't need to know Spanish to participate in the Au Pair Spain program, but knowing some basics will be beneficial. Often, at least one member of your host family is conversational in English, but not always. InterExchange will provide pre-departure resources, including language-learning resources to help you out. You'll also have access to our free Language Partner Program. Danielle dining on Spanish cuisine. Image courtesy of Danielle M.
Besides the language, there will certainly be cultural aspects that will take time to learn. You'll be living with Spanish hosts, who will be welcoming you into their home and family. The food they provide may be a bit different than what you're used to in the U.S. (as well as the time they eat dinner!) Don't be afraid to engage and join them for family meals and activities so you can soak up the full experience of living in Spain. And never be afraid to ask questions! 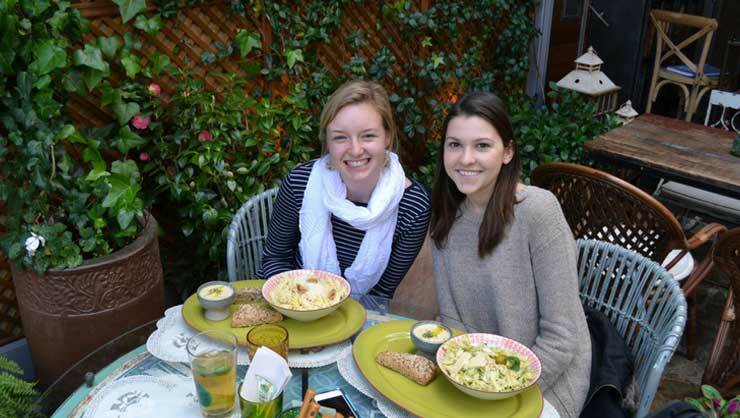 Think you'd like to try your hand at the Au Pair Spain program? Just let us know! We're available for personal support leading up to your program and look forward to hearing from you.